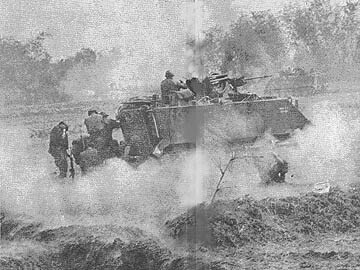 TAY NINH - In just a few hours elements of the 1st Brigade reinforced Regional Force elements heavily engaged against VC and NVA forces 14 miles southeast of Tay Ninh City. The Tropic Lightning soldiers moved from their position nine miles northwest of Tay Ninh to bolster their Vietnamese allies in their fight against an estimated NVA battalion. Within minutes after receiving the word, companies C and D of the 3d Battalion, 22d Infantry, Regulars were preparing to lift off from fire support bases Washington and Buell. 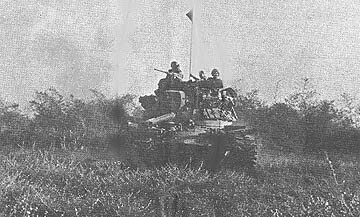 Bravo Battery, 7th Battalion, 11th Artillery, was on its way to Fire Support Base Hull five miles southeast of Tay Ninh to train its big guns south toward the area of contact. Daylight was fast disappearing when companies C and D flew into the contact area "We sure landed in a very hot spot," said First Lieutenant Donald I. Haramoto of Makawai Maui, Hawaii, Charlie Company commanding officer, "There were rice paddies all around us and a small nearby village full of VC." Company D, commanded by First Lieutenant Dale N. Richey of Fayetteville, N.C., came in on the heels of Company C and also received a hot reception. The Regulars quickly consolidated their forces establishing a defensive perimeter, girding themselves for a night of combat. "We began receiving rounds from the rice paddies and hamlets to the south," said Sergeant Eric Morris of San Francisco, Calif. "It was good time for some support." "The flares are so bright I can easily see the whole area," radioed the Forward Air Controller. "Very fine," replied Lieutenant Colonel Alexander Hunt of Wealder, Tex., commanding officer of the 3d Battalion. "Your target is the rice paddy bounded on the right by a long hedgerow." Soon the strikes were on the way, pounding the enemy soldiers who decided to try to hold their own. In all, 26 air strikes were called in on the enemy that night and the following morning. While the aircraft were blasting away, the Regulars finished establishing their night defensive positions, sealing off an important area of escape for the trapped VC and NVA. Regional Forces and American forces had forged an ironclad ring around the enemy-infested area. It started around 2:15 a.m. A torrent of RPG rounds, mortars and automatic weapons fire rained in on the defensive perimeter. The VC tried to break out through Charlie Company's section of the perimeter. "They walked up along a nearby road. Boy, what nerve," said Specialist 4 Jim Rodgres of Blythville, Ark. A VC RPG team was drawing a bead on a group of four defenders when an M79 round put an end to their night's activities. A Kit Carson Scout with Company C had knocked them out with a single round. Despite the heavy RPG and mortar barrage, the determined effort by the trapped VC to break toward the Cambodian border was an utter failure. When morning came the Regulars and the Regional Forces prepared to sweep the area. The search revealed a total of 96 enemy dead, their bodies clad in forest green uniforms either impaled on the wire or lying nearby. The 128th Helicopter Company cruising the area in support paid the enemy back for the many aircraft rounds fired at its choppers from around the hostile area. Just five miles northwest of the contact area they spotted five NVA soldiers in a bunker, engaged them with rockets and got a body count of four. In all, allied infantry and support accounted for a total of 100 enemy killed while suffering light casualties. DAU TIENG - "Tango ... Tango. This is Dustoff Seven Zero back on station. What's the situation down there, old buddy?" For a platoon leader pinned down below by the raking fire of enemy machine guns, those were welcome words. 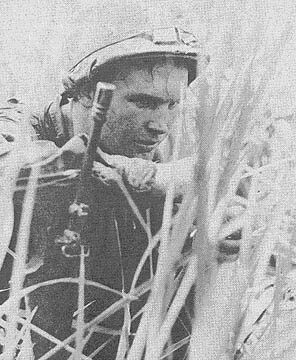 Staff Sergeant Dawson Jones of Bessemer, Ala., of a company of the 4th Battalion, 9th Infantry Manchus, was lying in an open field ten miles southeast of Tay Ninh City, unable to move as a Viet Cong force of unknown size continued to level automatic weapons fire over the area. Minutes earlier, the Manchus, under operational control of the 2d Battalion (Mech), 22d Infantry, had touched down on a helicopter assault into a cold landing zone. CU CHI - In a display of aggressiveness and daring, Golden Dragons from the 2d Battalion, 14th Infantry, killed 15 VC and captured numerous weapons while sustaining no friendly casualties. A heliborne assault of a VC base camp and staging area on the Oriental River took the enemy completely by surprise. "We landed right on top of them," said the commanding officer of Alpha Company, Captain Wayne A. Downing of Peoria, Ill. "They were running all over the place, and the gunships cut down three of them as we were jumping out of our chopper." The 2d platoon was the first to encounter the enemy as the lead element received small arms fire from a hedgerow on their right flank. "We killed two VC in the woodline before spotting several more trying to escape by hiding in the river," stated First Lieutenant William Norton, 2d Platoon Leader. The 2d Brigade soldiers pursued the fleeing VC into the river and accounted for nine more kills as the enemy attempted to hide under water and behind floating logs. 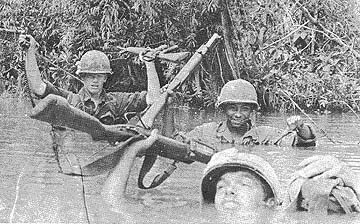 "In the process of rooting out the VC we discovered they had thrown many weapons into the water," said the platoon leader from San Francisco. "I had passed my M-16 to shore and was helping retrieve them from the water when suddenly I spotted a VC crawling toward me. I yelled for a covering element on the opposite bank to open up on him, and I went under water as they fired over my head - killing him," Horton continued. More weapons were found in ten 55-gallon oil drums that had been sunk in the ground but left uncovered as the VC made their hasty retreat. The partially underground camp that the Tropic Lightning soldiers invaded was a large, fully equipped complex containing approximately 50 permanent bunkers, four mess halls, a hospital complete with litters, plasma, and surgical instruments capable of handling one hundred patients. There were numerous sampan ports leading onto the river. "I would contribute the total success of our mission to the aggressiveness of my men," stated Downing. "They went right in there without any confusion and caught the VC by surprise." In addition to the 15 dead enemy and three detainees, the Fire Brigade soldiers also captured two RPG-7 launchers, one 60mm rounds, ten 106 recoilless individual weapons, 33 AK-47 magazines, 3,750 rounds of AK ammo, four radios, five claymore mines, four field phones, one pair of binoculars, three pounds of documents, three pounds of medical supplies, and eight NVA web belts. 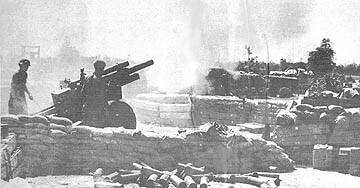 The Golden Dragons destroyed two 75mm rounds, twelve 60mm rounds, ten 106 recoilless rifle rounds, 500 RPG-7 rounds, eleven RPG-2 rounds, three 2mm mortar rounds, 1500 rounds of small arms ammo, four sampans, and 35 bunkers. The soldier who fought at Valley Forge could expect only 'drumhead justice' if he ran afoul of military law. The trooper at Gettysburg could expect little more. Even the doughboy who went ashore with Pershing had nothing like the legal protection of the civilian at home. That has changed now. The man who dons the uniform of his country today does not discard his right to fair treatment under law. The first great step came in 1950. It was then that our servicemen and women were given the Uniform Code of Military Justice, the most sweeping development in military law in all our history. Today we advance again. The Military Justice Act of 1968, which we sign now, will stand proudly next to the 1950 law. It expands the concept of fairness by creating an independent court system within the military, free from command pressures and control. It enlarges the rights of the individual soldier by giving him trained legal defense when he is tried by a special court-martial. It makes many other changes to streamline the system, and to safeguard the serviceman. New Year's Resolution - Safety! The month of January 1969 has been designated as USARV SAFETY MONTH. The intent of establishing a safety month is to focus command-wide attention on the overall USARV safety program. The goals during the month of January are not only to achieve a substantial reduction in the present high accident rates but to instill an improved degree of safety consciousness in each soldier. The prime targets of this program are accidental gunshot wounds, Army motor vehicle accidents, burn injuries and water safety. Accidents in these categories continue to occur in ever increasing numbers. Added to the Tropic Lightning Combat Honor Roll this week is Specialist 4 Barry L. Aumiller of Company A, 2d Battalion, 27th Infantry Wolfhounds. Aumiller distinguished himself by heroic actions on November 28, 1968. While established in their night defensive position, the company came under a massive communist, ground assault. 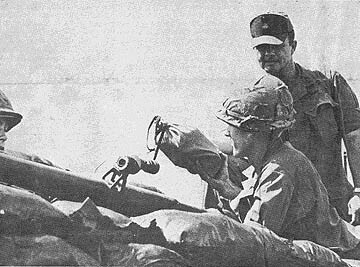 Spying an insurgent preparing to throw a grenade into a comrade's bunker, Aumiller exposed himself to the intense fire and killed the Viet Cong. He observed three aggressors about to assault his unit's command post and single-handedly pursued the enemy, killing the three aggressors. His valorous actions were responsible for preventing the destruction of his unit's command post, and the defeat of the numerically superior force. His bravery and devotion to duty are in keeping with the highest traditions of the military service and reflect great credit upon himself, his unit, the 25th Infantry Division and the United States Army. TAY NINH - The two wars in Vietnam are going well for allied forces. At every turn the enemy has been thwarted in his attempts at military conquest of the South, and he has been thwarted in his attempts at political conquest as well. The major factor in his failures in the political war in huge Tay Ninh Province, on the Cambodian border, is the 1st Brigade Civic Action (S-5) section. Under the leadership of Major Clarence M. DeYoung, of San Diego, Calif., the S-5 section has aggressively embarked on a half dozen major projects during the month of November. The main emphasis for November was on the PSYOPS (Psychological Operations) programs designed to win the confidence of the people. "One of the precepts of a successful S-5 program is to include the local officials wherever and whenever possible. In this way, we are not bringing glory to Americans, but are showing the people that the Saigon government is their government," said De Young. One of the more successful programs has been the VIP (Voluntary Information Program). Under this program, civilians are paid for information of value to allied forces. Payments are made at the lowest level practicable. During November, more than 75,000 piasters were paid to civilians in Tay Ninh Province for information ranging from the location of a single round of small arms ammunition to the location of a VC/NVA platoon. In November, the 1st Brigade S-5 section conducted 146 MEDCAPs (Medical Civic Action Program), treating 13,911 patients and distributing more than 350,000 posters and leaflets. "Most of these have been in outlying hamlets. We're on top of the situation in Tay Ninh City and we've turned our attention to the small hamlets that have felt the ravages of war. We let these people see that they have not been forgotten and that the Government of Vietnam is interested in them and in gaining their confidence," said Captain Charlie W. Smith of Atlanta, Ga., the assistant S-5. One of the more interesting MEDCAPs is conducted weekly in Phuoc Tan. Phouc Tan is located less than 1,400 meters from Cambodia in a remote corner of Tay Ninh Province. Accessible only by air, the entire population of the hamlet (150) shows up for every MEDCAP. 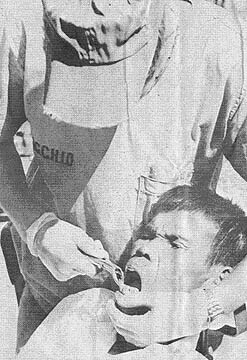 "After we have treated all the patients, the Province Chief, Colonel Nguyen Thong, talks to the people and passes out leaflets and T-shirts and soap. "We get quite a bit of information from Phuoc Tan, but more important, the province chief, roughly equivalent to a governor of a state, has face-to-face contact with people who have never seen a representative of the GVN before - and they are impressed by Colonel Thong." During the month of November, the S-5 section has distributed, through local officials, 1,500 T-shirts, 500 balls, 500 kites and 1,200 school kits. All of these items bear the slogan, "Your future lies with the GVN. I support the GVN". The appeal is simple, but effective. Not all of the gifts carry political messages. For instance, last month the S-5 section distributed 3,000-bars of soap to medical patients and 1,000 health kits. The enclosed literature simply gave instruction on the use of the items and basic health education. There was no political message, but the recipients know where the much-needed health items came from, and therein was the softsell political message. The self-help program received renewed emphasis during November. The S-5 section furnished materials to the Long Hoa school; and the students, their parents, and school officials provided the labor. Years from now, members of the S-5 section will have something "constructive" to reply when asked, "What did you do in the war, daddy?" CU CHI - A class approaching graduation from the Lightning Combat Leadership Course (LCLC) took their final exam under fire near Cu Chi when the last exercise in the course, an all-night ambush patrol, came under fire. 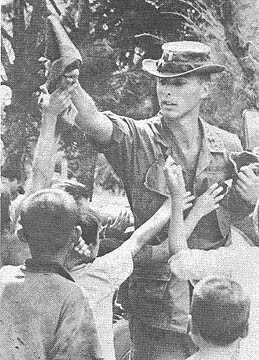 On December 12 a platoon of students led by Staff Sergeant John N. Montgomery of Gallie, Fla., an LCLC instructer, left Cu Chi. The patrol was about 600 meters out of the gate at 7:30 p.m. when the scout dog alerted, and his handler spotted a VC. A fire fight developed, and Montgomery estimated from the fire that they were in contact with an enemy platoon. The patrol's grenadier, Sergeant Raymond Thomas of Phoenix, Ariz., expended 42 of the 45 rounds fired in the brief but heavy exchange. "He was putting out the rounds, blowing up the place," Montgomery said. The patrol broke contact, dropped back 300 meters and called in artillery from the 1st Battalion, 27th Artillery. "We saw one secondary explosion, so they must have had something stockpiled in there," said Montgomery. 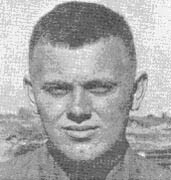 Private First Class Jerry C. Molan of Lebanon, Ore., was the student patrol leader on the ambush patrol. It was his first taste of combat. "I was just thankful to the school for teaching me some of the finer points. I was scared, sure, but I knew what to do," said Molan. The assistant student patrol leader, Private First Class Fred Jenkins of Covington, La., learned his lessons too. "The school is great," he said. "It was a big help in teaching me how to deal with Charlie." The men on the ambush patrol returned to Cu Chi at 8 a.m. from the roughest final exam they'll ever take. DAU TIENG - A mysterious rustling sound in nearby brush led Wolfhounds of Bravo Company, 1st Battalion, 27th Infantry to a cache including more than 200 anti-tank RPG rocket grenades. A point man, Private First Class Raymond J. Mosley of Waterloo, La., and four other Tropic Lightning infantrymen of the 3d Brigade, were sent to investigate the noise, apparently made by a departing enemy. The Wolfhounds were sweeping through heavy vegetation of the Trapezoid, 35 miles northwest of Saigon. "We found a bunker complex, so we called the platoon tunnel rat," said Mosley. The tunnel rat, Private First Class Danny L. Hughes of Keasaugua, La., crawled through tunnels and trenches while the rest of the platoon checked the topside of the complex. Hughes and Sergeant Gary L. Lemonds of Social Circle, Ga., the squad leader, were the first ones into a bunker which housed the enemy cache. It included 207 deadly B-41 rounds and seven smaller B-40 rounds and 85 boosters. Also inside were a carbine and 201 rounds of ammunition. The enemy had also left behind a typewriter, five pounds of clothing and a hand grenade. The Wolfhounds called in engineers who destroyed the four bunkers and several trenchlines and tunnels in the complex. "All of the RPGs could have put us in a hurt," commented Lemonds. "I'm glad we found these rocket grenades before Charlie had a chance to point them at us." CU CHI - Fire Brigade infantrymen from the 2nd Battalion, 27th Infantry Wolfhounds located a large enemy rice cache on a sweep near Fire Support Base Crockett III. The 3d platoon, Alpha Company soldiers had just landed and were only 200 meters from the LZ when they made the find. Private First Class Howard Williams was walking just behind the pointman when he looked to one side and saw something shiney and knew it didn't belong there. It turned out to be a Viet Cong poncho. Under the poncho were 1,500 pounds of rice in 50 pound bags. After securing the rice the Tropic Lightning soldiers made an intensive search of the area. Private First Class Blairs Stillwell, of Trenton, N.J., uncovered a bunker nearby used by VC as living quarters. "The occupants had left in quite a hurry; there was rice still cooking inside the bunker," Stillwell said. Also found nearby were 355 fifty-pound bags of rice, two and a half pounds of medical supplies, 30 cannisters of glucose, and a pottery container of documents. JANUARY began a busy year for Tropic Lightning. The 1st Brigade moved to Tay Ninh base camp as Operation Yellowstone saw the division combing the area north of Cu Chi. A five mile tunnel complex, considered a main infiltration route was uncovered in the Iron Triangle. The month saw the 3d Brigade at Soul Cut beat back savage ground assaults to kill 382 enemy in one night. Then the 1st Battalion, 27th Infantry killed 191 more enemy while a record rice cache of 231 tons was uncovered. FEBRUARY saw action increase as the Tet Offensive gained impetus. 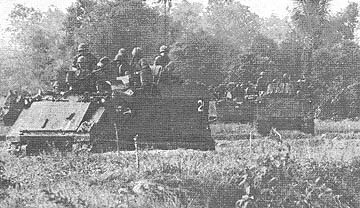 Over 750 enemy were killed in a three week period between Cu Chi and Saigon as Operation Saratoga commenced. Flashing action was evident such as when the 2d Battalion, 27th Infantry Wolfhounds smashed through 250 meters of bunkers, machine gun nests and trenches to help a 3/4 Cav platoon in the Hobo Woods, killing 68 enemy. Then B Troop, 3/4 Cav raced kilometers from the Trang Bang Bridge to Tan Son Nhut to aid a sister troop and halt the enemy as part of a battle which killed 400 enemy. MARCH saw the end of Operation Saratoga and the end of tri-brigade action between the Saigon River and Cu Chi. Two hundred forty three enemy died in the first week. 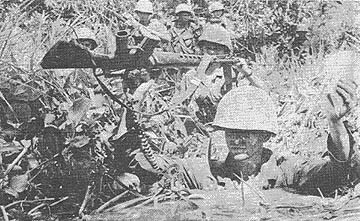 Operation Resolved To Win began, highlighted with such action as the 4th Battalion, 9th Infantry killing 169 enemy 8 kilometers north of Saigon, the 3d Battalion, 22d Infantry taking to the water north of Cu Chi and eliminating 100 enemy and the 2d Battalion, 12th Infantry accounting for 122 more. The new operation swept west from Saigon to the Cambodian border, into the long time Communist stronghold, the Hobo Woods. APRIL'S pace continued as before with the arrival of Operation Quyet Thang. In some of the bitterest fighting since the Tet Offensive, division elements and ARVN forces killed 470 enemy in three days near the Highway One district capitol which stopped a new offensive against Saigon, wiping out two NVA battalions. 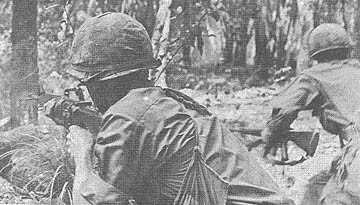 Heavy fighting within the limits of Tay Ninh City resulted in 137 enemy killed by the heroic efforts of just 50 Tropic Lightning soldiers who lost only four of their number. The month was wrapped up by the 3d Battalion, 22d Infantry Regulars repulsing an attack on their night position. They killed 124 enemy in that action. MAY saw the second Saigon offensive begin. A task force from the 2d Brigade composed of infantry and armored cavalry killed 134 NVA in a two-day battle 10 kilometers from downtown Saigon. Then, eight kilometers southwest of Cu Chi, four battalions and one troop and an attached armored cavalry regiment backed an NVA battalion to a swamp and decimated it, killing over 350 in three days of heavy fighting. Another NVA battalion lost 218 as it tried to get away from the Saigon area. IN JUNE, near Cu Chi, 99 enemy were killed in two days while an abortive attack on a 1st Battalion (Mechanized) 5th Infantry night location near Trang Bang left 34 enemy dead. 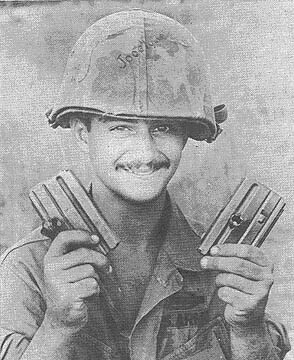 Tropic Lightning, now in Operation Toan Thang I, began combing the area near Saigon for weapons caches and supplies left from the past month's fighting. Third Brigade soldiers uncovered tons of mortars, rockets and other supplies. The month ended with the 2d Battalion, 27th Infantry killing 71 during an NVA battalion's attack on their night position 11 kilometers northwest of Saigon. JULY was the month Operation Toan Thang II began, as the division concentrated on rooting out VC personnel, weapons and means of operation. Contact began near Trang Bang as the 2d Battalion, 22d Infantry and ARVN soldiers, working with the 101st Airborne Division, killed 45 enemy. Four division soldiers received the Distinguished Service Cross. The month also saw a ground attack made July 4 on Dau Tieng crushed. 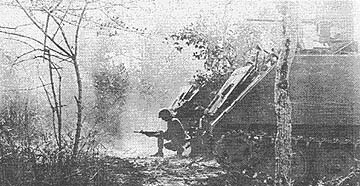 AUGUST will be remembered as the month the enemy launched a massive attack near Tay Ninh and Dan Tieng. Beginning at Fire Support Base Buell II and Nui Ba Den, an estimated regimental size force tangled with Tropic Lightning soldiers during the last weeks of August and the first week of September. In one week, over 900 enemy died, as many as 182 in an hour and a half when the 1st Battalion, 5th Infantry Bobcats counter-attacked in the Ben Cui Plantation. 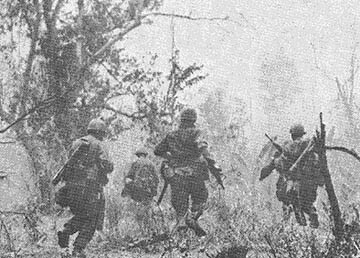 Another highlight was an ambush patrol of the 2d Battalion, 27th Infantry accounting for over 100 enemy near Tay Ninh. Major General Ellis W. Williamson replaced Major General F. K. Mearns as Tropic Lightning commander. SEPTEMBER saw sporadic and fierce fighting after the initial August attack. Fire Support Base Schofield near Dau Tieng beat back an attack, killing 102 enemy. While the division celebrated its 27th anniversary another attack on Fire Support Base Buell II was crushed by the 2d Battalion, 27th Infantry Wolfhounds. In the earlier attack 10 enemy perished. IN OCTOBER action slowed and Tropic Lightning again went in search of the enemy and his supplies, rooting out many infrastructure personnel and seriously impairing the Viet Cong organization. The month was highlighted by three ground attacks on the 1st Battalion, 5th Infantry, in five days. Enemy killed numbered 128. 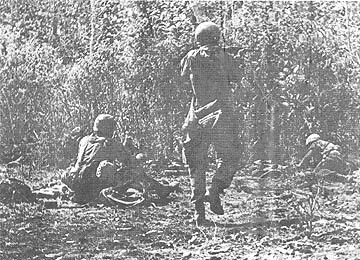 NOVEMBER'S activity began around Trang Bang again as 2d Brigade units with elements of the 101st Airborne killed 147 enemy during two days of fighting. The month saw the opening of the Cu Chi Hilton and the Holiday Inn at Tay Ninh for infantrymen "standing down." 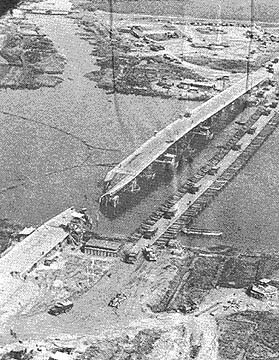 After saboteurs blew up the Phu Cuong bridge, a combined engineering effort by US and ARVN forces put up a temporary bridge in less than 26 hours. A new fire support base was established in the Iron Triangle, and the 1st Brigade thrust deep into War Zone C along Route 22 to open up the area near Fire Support Base Phillips. AS DECEMBER ends, Tropic Lightning's never-ending civic action activity and search for the enemy continues. An abortive attempt to ambush a resupply convoy cost the enemy 73 dead near Dau Tieng. Activity has increased near Trang Bang again and thoughts are turning towards the new year ahead. DAU TIENG - During the year 1968 the 3d Battalion, 22d Infantry has proved to be one of the most decorated units in Vietnam. Since the middle of April the Regulars have been awarded 52 Silver Stars, four Distinguished Service Crosses, more than a hundred Bronze Stars for valor and more than 150 Army Commendation Medals for valor. The Distinguished Service Cross has been presented to Captain Gerald White, First Lieutenant Phillip C. Bryant, and Specialists 4 Richard Stuart and David Chedester. Lieutenant Colonel Alexander H. Hunt of Wealder, Tex., the Regulars commander, frequently travels to the many locations occupied by the units under his command to distribute the awards to the recipients. "It is my intention to have the awards presented to the men in the presence of those they have served with these many months," said Hunt. "An awards ceremony is always of prime importance to the recipient, but also to his unit and his fellow soldiers. That is why we are conducting the ceremonies in this manner." Colonel Lewis J. Ashley, commander of the 3d Brigade, has heaped praise on the battalion's awards and decorations section. "The 3d of the 22d deserves the high number of awards they are receiving. Since the beginning of this year the battalion has borne a large part of the fighting burden in our area of operations and has done outstanding work," said Ashley. CU CHI - Four wounded detainees recently got a taste of their own medicine, and almost didn't get a chance to taste ours, when their 'comrades' threw a barrage of automatic weapons fire into the ambulance helicopter that was evacuating them. The unarmed aircraft piloted by Warrant Officer Theodore C. Jacoby of the 159th Medical Detachment, 44th Medical Brigade, was clearly marked by its distinctive Geneva Red Crosses, but it sustained seven hits through the cockpit, cargo and engine compartment areas. 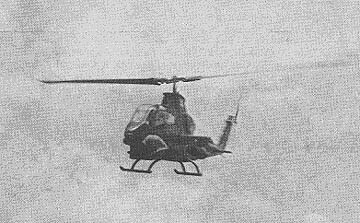 Oil pressure began to drop and noxious fumes had entered the cockpit when the pilot made a precautionary landing on Highway 1, near an ARVN outpost. Another dustoff ship was in the area, and the crew and patients were taken aboard while the South Vietnamese provided a protective perimeter. CU CHI - Tropic Lightning soldiers of the Fire Brigade's 2d Battalion, 12th Infantry, supported by gunships and air strikes, killed four enemy and captured a highly prized RPG-7 launcher during a combined U.S.-ARVN operation near Trang Bang. "Point elements from the 2d Platoon spotted several Viet Cong disappearing into a thick hedgerow complex and opened fire," said Alpha Company Commander First Lieutenant Richard A. Wiggins from St. Petersburg, Fla.
One enemy was killed in the first moments of contact. An allied assault then drove the VC into defensive positions where air strikes and gunships killed three more. CU CHI - Fifteen Air Force B-52 crew members from the 99th Tactical Bomb Wing, Strategic Air Command, recently visited the Division base camp at Cu Chi. The 99th's home base is in Westover, Mass. The crew members, 14 officers and one senior enlisted man, comprising two complete B-52 bomber crews, received a series of briefings on their mission and effectiveness in operations conducted within the Tropic Lightning zone of responsibility. The briefing, conducted by 25th Infantry Division Chief of Staff, Colonel Gordon W. Summer and representatives of the G-2 and G-3 sections at Cu Chi, was given at the Tactical Operations Center at the main base camp. Colonel Summer, in emphasizing the effectiveness of the B-52 bombing program, cited numerous Viet Cong withdrawals into Cambodia and North Vietnam directly following the air strikes. G-3 Operations Officer, Major Forrest J. French, a native of Bay Shore, Long Island, N.Y., explained how decisions are made by Army G-2 and G-3 sections to strike an area with B-52s. French outlined each step of the call for air stikes from the initial request at Army Intelligence level to the commanding general's and MACV's approval. After approval, the "Strike Message" is received at the 99th Bomber Wing's operations center. Following the briefing, the men were split into teams of twos and sent to fire support bases in the 25th's operational area. The purpose of the Air Force crew members' trip into the field was, in Colonel Sumner's words, "to see the other side of the attack, the infantrymen's view." 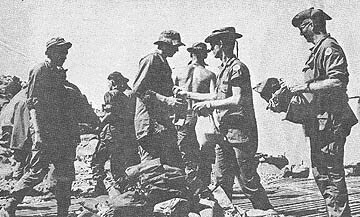 Soldiers of the 1st Brigade scored another first as they were the initial recipients of Red Cross 'Ditty Bags' for the 1968 Christmas season. 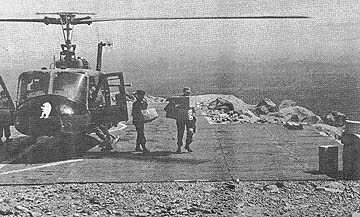 The bags were helilifted into a communications complex high atop Nui Ba Den Mountain in central Tay Ninh Province. Contents of the bags included soap, wash cloths, playing cards, stationary, envelopes, recording tapes, candy, nuts, pens, combs, soap dishes, cigarette cases, nail clippers, gum and a greeting card giving the name and location of the donating Red Cross chapter in the states. The 250 Ditty Bags were delivered by Mr. Richard A. Heiens, of Alton, Ill., acting field director for Tay Ninh West base camp. 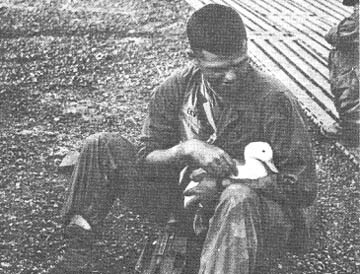 He was assisted by Eldon R. Cox, of Odessa, Tex., assistant field director at Tay Ninh, and Andy B. Moore of South Hampton, Mass., field director from Cu Chi base camp. The bags were presented to the men under the approving eyes of Major Walter D. Everhart of Atlanta, Nui Ba Den commanding officer, and Captain George D. Featherstone of Houston, commanding officer of Bravo Company, 3d Battalion, 22d Infantry. The men received their gifts at their duty stations: in bunkers, manning complicated communications equipment, repairing defensive positions or pulling KP. Each man appreciated the useful remembrances from the people back in the world. RED CROSS 'ELVES' UNLOAD GIFTS - Red Cross Field Director Richard A. Heiens from Alton, Ill., and his assistant Eldon R. Cox of Odessa, Tex., unload ditty bags from Colonel Robert L. Fair's command and control ship. The bags, the first to be distributed in Vietnam this holiday season, were passed out to the 250 defenders of the relay station. CHRISTMAS BAGS DELIVERED - Specialist 4 Tom LaFerry of Chattanooga, Tenn., (left) and Private First Class James Grace of Albany, Mo., pause atop their bunker on Nui Ba Den as Major Everhart passes out the presents to his men. 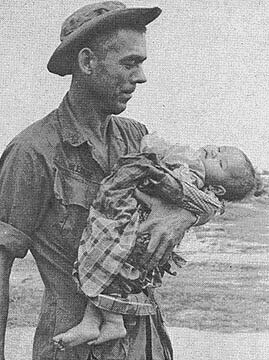 RED CROSS - Delving into the pile of Christmas Ditty Bags and distributing them to the men of Bravo Company, 3d Battalion, 22d Infantry on Nui Ba Den is Richard A. Heiens of Alton, Ill., field director for the Red Cross at the 1st Brigade. SANTA CLAUS - He may outrank every man on Nui Ba Den, but to the staunch defenders of the strategic mountain top, Major Walter D. Everhart, from Atlanta, Ga., is indeed Santa Claus. He distributed the red and green Red Cross ditty bags to every man. Getting their gifts are (left to right) Specialist 4 Greg Doigneau of Detroit, Private First Class Joe Pinski of Buffalo, N.Y., and Private First Class Dennis Adams of Lebanon, Ore.
DAU TIENG - "When he fired, I felt something poking at my side. A little smoke was coming out of my magazine belt. I didn't have time to think much about it." That was how a 3rd Brigade infantryman described being hit by a burst of enemy AK-47 and emerging unscratched. The rifleman, who was walking point for Alpha Company, 4th Battalion, 9th Infantry Manchus, was searching a sack of rice he found on a log table in an enemy eating area while pushing through a hedgerow 11 miles east of Tay Ninh City. "I dove for cover behind a heavy wooden bench," said Private First Class Gary D. Fiumara of Brooklyn, N.Y.
Fiumara returned fire until he was able to crawl back to the rest of his platoon, which was just reaching the hedgerow when the firing began. The Manchus continued searching the area and engaging snipers for more than an hour, with unknown results. A lull followed, and Sergeant Gary C. Weyant of Middletown, N. Y., a squad leader, came up to talk to the point man. "Hey, man, your bandoleers are full of holes. What happened?" asked Weyant. Fiumara was astounded to find that two belts of ammunition he was wearing around his waist had absorbed nine rounds of rifle fire. Two rounds were still lodged in the metal. The smoke he had seen earlier was apparently caused by burning gunpowder. "I still can't believe it," Fiumara said after his company returned from the day's sweep. "I must be one of the luckiest guys alive." CU CHI - Tropic Lightning infantrymen of Bravo Company, 2d Battalion, 12th Infantry, killed five enemy soldiers and apprehended four suspects in a day of sporadic contact 10 miles north of Cu Chi. "We caught them napping," according to 1st platoon rifleman Specialist 4 John Washington from Macon, Ga. "Some were lying in hammocks near a hootch; others, wearing web gear just standing around as though waiting for instructions." The first platoon point element opened fire on the VC who broke and ran. Within minutes the Fire Brigade soldiers began receiving small arms and automatic weapons fire from the front. "When we began to get fire from our right flank it was time to call for gunships and air strikes," said Sergeant Larry Fontanna of Napa, Calif.
After nearly an hour of continuous aerial bombardment, the 2nd Brigade soldiers assaulted the enemy positions. "We moved on line; if any of them got out they had to have gotten out fast," said Private First Class Robert Delaperriers, Levitown, Pa. The fleeing enemy left fast enough to neglect taking along two highly prized RPG-2 launchers, five individual weapons and 1,500 rounds of ammo, 10 grenades and documents. In addition to the five enemy killed by infantrymen, three more were killed by supporting gunships three miles east of Trang Bang. "It was a heads-up operation for Bravo Company. They're working as a fine team," commented Lieutenant Colonel Thomas Driessenstok, White Warrior battalion commander from Washington, D.C.
troops were unable to even crawl out of the deadly crossfire. At the same time, they became separated into two elements. Immediately two radios were knocked out and Jones was left with his element's only link to help. He was able to talk to the "Triple Deuce" battalion command post, but their return messages were garbled. At that moment Dustoff Seven Zero, arriving on station in response to a call for help, ascertained the difficulty the two elements were having and took the role of go-between for the delicate thread of radio communications. Every message from the trapped company was relayed verbatim to the battalion command post. "It was almost as if the pilot of the medevac ship had a photographic memory," said Sergeant First Class Augustine V. Cardinali of Niagara Falls, N.Y., Triple Deuce operations sergeant. 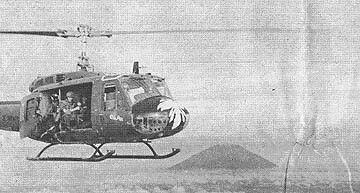 For the next five and a half hours, the medical evacuation helicopter from the 45th Medical Company (Air Ambulance), 44th Medical Brigade, remained above the battle, leaving only once to refuel. Small arms fire continued to harass the stricken Manchus, but the Dustoff ship braved unknown enemy firepower to bring out the wounded infantrymen. Other medevac ships followed as the siege of the beleaguered company was lifted. Another Manchu company linked up with its sister company and reestablished communications as the Viet Cong skulked away. The battle was over. But the role of the Dustoff ship was not forgotten. Back in Fire Support Base Wood, Staff Sergeant Jones, praising the role of the helicopter, said "I hope to meet those guys and shake the hand of everyone aboard that ship." Other Manchus agreed that, had not the medevac ship been there, the toll of the battle might have been worse. Those aboard the chopper, however, had been nonchalant as the ship left to carry the wounded to medical attention. In response to a radioed word of thanks from the ground, the pilot said simply, "No sweat fellas, anytime. Dustoff Seven Zero, out."